When the Spanish newspaper, Marca, printed their story that Ron Dennis was about to be fired, we all had a good laugh at how desperate the press can get when short of a good story. It was fun to point out the obvious fact that Ron cannot be fired since he still owns McLaren, even though most of the shares are in names other than his own. Then The Sunday Times ruined the fun with its article suggesting that Ron would be stepping down officially at some time this week. Talk about a party pooper. The Sunday Times is a big enough name not to be dismissed as a sensationalist rag and so we had to sit down and assess the possibilities that Ron might really be about to go this time. Whether we're for or against him, Ron's departure would leave a pretty big hole in F1, one that it's unlikely Martin Whitmarsh would fill without many years of trying. The personalities of the sport create its image to a large extent. If Max and Bernie were to go tomorrow, for instance, F1 would look very different on Wednesday, regardless of who replaced them. No-one is indispensible, it's true, but the big characters create niches that are impossible to replicate on their departure. Who could fill the boots of Paul Stoddart, for example, or entertain us so magnificently as Flavio Briatore in full flow? Love him or loathe him, Ron Dennis is one of these; we should think carefully before celebrating his departure. He made McLaren what it is today and it will become something else after he leaves, whenever that is. Those who can remember the team as it was when run by Teddy Mayer will know how great a change Ron made when he took over. If it is to be Whitmarsh's team, it will change again. There will be those who will be glad to see the back of Big Ron, even so. Doctor Vee considers that he is so tainted with the poison of the Ferrari documents affair that he is nothing but a liability to McLaren and Mercedes now. I am not so sure. There are many, including myself, who have had their opinion of the man raised, rather than lowered, through the whole sordid business. Call us gullible if you wish, but we still believe that Ron has been honest to the extent of his knowledge in dealing with the issues that arose. And apart from that, his restraint and dignity in answering his critics has been commendable - witness the swift climbdown of the Italian police after being challenged on their statement regarding the recent raids on McLaren properties. Ron is no lame duck; he is the creator and leader of one of the most effective and efficient F1 teams in the game and he will go when he decides, not when the mud-slinging reaches a crescendo. I find it amusing that the sister paper to The Sunday Times, The Times itself, took the bite out of the whole story with its Friday article entitled Defiant Ron Dennis determined to fight on. There are some signs that Ron has been moving towards a less prominent role in the company, that is true. But it is quite likely that this was planned long before the Stepneygate thing erupted; Ron has made no secret of the fact that Whitmarsh was being groomed as his successor, after all. And, perhaps with more irony than his detractors can see, the disasters of 2007 may well have been instrumental in persuading Ron to delay any decision regarding retirement until he has seen the company through to calmer waters. The man is a fighter, you have to give him that. I have made a point of trying not to comment on this story aside from having a go at the original Marca item. However I think if there is any truth in any of it Ron would retire as team principal but stay on as Chairman and CEO of the McLaren Group. So although technical and officially the baton would be passed to Whitmarsh Ron would still be his boss and still be in control of the company. Personally I hope he stays and fights but after the year he has had it would be understandable if he wanted a little bit of piece and quiet. Dennis has been saying for a while now that he has his succession planned and mapped out in advance. He alludes to stepping aside or stepping up instead of stepping down. We have no way of knowing whether last years farce will speed up or delay those plans, but I doubt it will alter them. He will not quit, and he won’t (can’t) get fired, so it’s up to him to decide what role he will play. My hunch is, even if he was going to step back this year, he’ll push it off a year, just to put some distance between it and the scandal. Ron may not have been the most touchy-feely character, and his mode of communicating was off-putting to some, but to me, the more Max bashed and insulted him, the more I moved over to Ron’s camp. He appears to be a control and neat freak, logical and unemotional, but he has spoken about the great pain he feels losing, and joy in winning. He’s not emotional in that Latin passionate way, but he clearly has a passion for the sport. One of the racers. Flavio has mentioned that Bernie is his best friend, and that they talk 6 times a day. He is inside the system. Ron fought the system, with only his team and F1 in mind, as opposed to Ferrari, who only have the team in mind. In a way Dennis is both establishment and maverick. I have great respect for how he took the whole mess on the chin and said “Let’s move on” when he was indeed treated to, in Brundles words, a witch hunt. I hope he stays on for as long as keeps him happy. The sport is far better of for him being in it. It would certainly be an option to put Whitmarsh in as race team boos, I agree, Steven. I wonder whether Ron is ready to do that yet, however - he is so important a component to the team. And, like you, I hope he stays and fights! Yes, I read your comment at F1 Fanatic, Arnet, and thought it an excellent description of Ron's qualities and importance to F1. I hope Ron reads this and realizes that we are not all against him. I feel sorry for Ron Dennis. Last year was quite obviously a killer for him, he was emotional at the majority of races during the second half of the season. What if he has been planning a retirement, or sideways step for a few years? Now all the papers will say it's because of the espionage thing. Should he stay just so he will be able to leave with his head held high? Rock and a hard place, if you ask me. asking a dumb question, but why "later this week"? if the rumours are true, what's he going to be doing until then? seems a bit protracted to me. All true, Christine, and it seems just to go on and on for him. I really wouldn't blame him if he just walked away. Good point, Sidey, and maybe a reason not to believe the rumours. Seems a bit masochistic to give hints but delay any formal announcement. But why would Dennis quit - if indeed that is his plan - one week before the start of the season? To my mind, if he was going to go it would be at a lot 'neater' time - at the end of last season for starters. I am in two minds about this one. On one hand I don't think Dennis should quit at the moment. Better to go out on a high, without the lingering stench of last years witchhunt. And why should he leave? He does have one of the most successful teams on the grid after all, in no small part of his doing. But having gone for the jugular and not succeded - will Mad Max and di Montezemolo give up? Or will they keep pushing - their clearly personal vendetta against Dennis - until something gives? It might be better for the teams prospects if Dennis was not it's figurehead. Depends on what he thinks is best for 'the team'. Anyway, if Dennis does leave I'd be sad to see him go. Actually Peril, it's Flabio and Bernie that are besties. "My partnership with Mercedes-Benz is just as strong as my relationship with McLaren, so I am completely relaxed." Yeah, I don't think Ron is besties with anyone. But the whole thing does seem very personal, just as you say, Peril. I'm not sure about the Hamilton quote, Punter. Isn't he avoiding saying anything by pointing out that he's okay, whatever happens? I don't think it's a veiled hint that Ron is about to go. The interesting thing is that, if you put that quote with Frank Williams' story of how he nearly took Hamilton on, you have a slightly different picture of the supposedly buddy-buddy relationship between Hamilton and Ron. They have had their differences in the past, it seems, and the Hamiltons, father and son, are quite prepared to go wherever they see the best opportunity. Oopps. Well, maybe Ron should try & besties with Bernie then - might improve his luck ! Sounds like the immovable object meeting the irresistible force with those two egos. I am not for this but I can see his point to step down. First I agree that the timing is not good. Maybe he should have done this at the end of last year. But I have to look at the timing of the search of his house and office. Last year, it is my opinion that the distraction caused by the scandel cost McLaren both championships. Mis-communication could be to blame for the mistakes made last year by the team. The Tyre issue is first that comes to mind. Any distraction for the team is harmful. I then look at the events of last week--Ron does not want this season to have any distractions. If he is the focus of the investegation by the Italiens then he would like to do it away from the team. I have to agree with him. Taking one for the team is an age old motto. 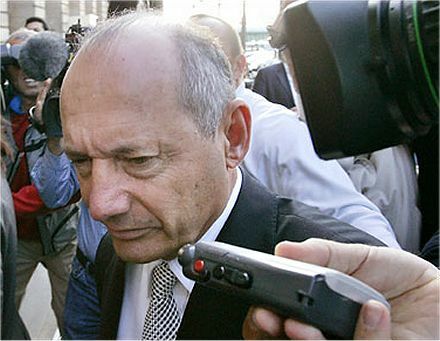 Ron Dennis, along with a few other pricipals have done more for F1 as a whole then the FIA has done as an organization. That being said I will certainly miss him as will the entire F1 community. Ron has groomed Whitemarsh for the position for some time now. I realize that a change in McLaren is enivitable with the switch. I anticipate that the change will miniscule at first. Why change a good thing. Sidey I agree why annouce your retirement to be later in the week. I am still trying to figure out what the advantage is to announce your departure in this manner. I just thought is was an "English" thing. But I guess I am wrong. We need to remember that nothing is confirmed as yet. The Sunday Times says it had the story from a reputable source but I'm sure Marca would claim the same. As long as the press can keep its "sources" secret, they can claim just about anything and add that they have it from a reliable source. The Guardian had him being relieved of his position at some point this week too, so for those two highly respected papers to lead with the story then we have to presume this is more than just speculation and something is in the pipeline. It may be that his replacement is proving tricky to find and that's why it's been delayed but no smoke without fire for me on this one and I expect him to leave in the next few days. It's looking likely Ron will retire. Why is that? Well, put simply, if Ron was planning to stay for the foreseeable future, he would have denied it right away. Leaving rumors like this, just lingering, don't do any good... unless they are more than rumors. It's a matter of finding the right time. Retiring when the media are all over the story isn't typical Ron. He'll wait for that time when everyone is looking somewhere else, so the media don't stampede him (well, not as badly anyway as if he were to retire right now). Ron hired Whitmarsh with a view to him taking over when Ron retired. That was 19 years ago. I have lost count of the number of times I have read over the years that now was the time. When Hakkinen won his championships. When Whitmarsh had been in his job for ten years. When Schumacher and Ferrari started to dominate. I don't recall Ron commenting on any of those. We will find out soon enough. If he is in Melbourne he is staying. If he is not in Melbourne he probably isn't. One of the problems with appointing a successor is it creates the kind of pressure we see now because people expect hi to succeed the incumbent. I find it strange that there is a similarity in what Ron is going through now and what Schumacher went through in his final season. The difference of course is the political animals at Ferrari backed the man who turned their team around into a corner and effectively forced him to retire. McLaren is not such a political team and they will give Ron space to make his own decision. Ferrari owe everything they are today to Schumacher but they couldn't help reverting to type and biting the hand that fed them. McLaren owes everything it is today to Ron Dennis. Hopefully they will have learned from Ferrari. I just hope they don't tell anyone they did. Joe Ramirez knows a thing or twelve about being successful in F1 and with McLaren. His comments at http://formula1sport.net/formula-1/mclaren-doomed-without-dennis-ramirez/ make very interesting reading. Hmmm, so F1 Betting and Journeyer are betting on the story being true, Steven Roy reckons it probably isn't. One thing I do know: apparently Ron will be in Melbourne although he may arrive late because of a near-clashing engagement. So we could carry on guessing for a while yet. It seems to me that what has has happened is this: Ron noted the fuss over the Marca story and discussed it with a trusted friend (he must have some after all). No doubt his tiredness came across and the friend has added two and two to make five. In a subsequent telephone conversation with another friend, he let slip the info that Ron was about to retire. Who knows how many friends became in involved in the change before the story reached The Sunday Times? Ron has denied the rumours in yesterday's Metro, so I don't think it's going to happen (unless the Metro got the wrong end of the stick - I have to say nowhere else appears to have picked up on the news yet). It's a silly game at times, isn't it, Alianora? Just discovered this website by accident, and I'm so refreshed to see articles that look beyond the obvious, and that do not pamper to the FIA. Ron should stay on to enjoy the fruits of his labour, and never buckle under the FIA injustices. Thanks very much, Ravino - it's always good to know that my articles are being read. And I shall continue to keep a close eye on the FIA and Max, etc. It's one of my favourite pastimes, after all!